Up next I will have a painting in the Sit Stay Art exhibit that benefits Pets and People Humane Society, and this year the show is in the wonderful Plaza District! In the past I have had the wonderful privilege of helping with the show, setting up the art and helping the artists organize and sell their work, and this year I will have a piece in the show at one of the Plaza District's spaces, Graphite Elements and Design - and the proceeds from the art sales will benefit Pets and People! The piece I am showing this year is Shaken not Stirred featuring Connery, a mix awaiting his forever home with Pets and People of Yukon. 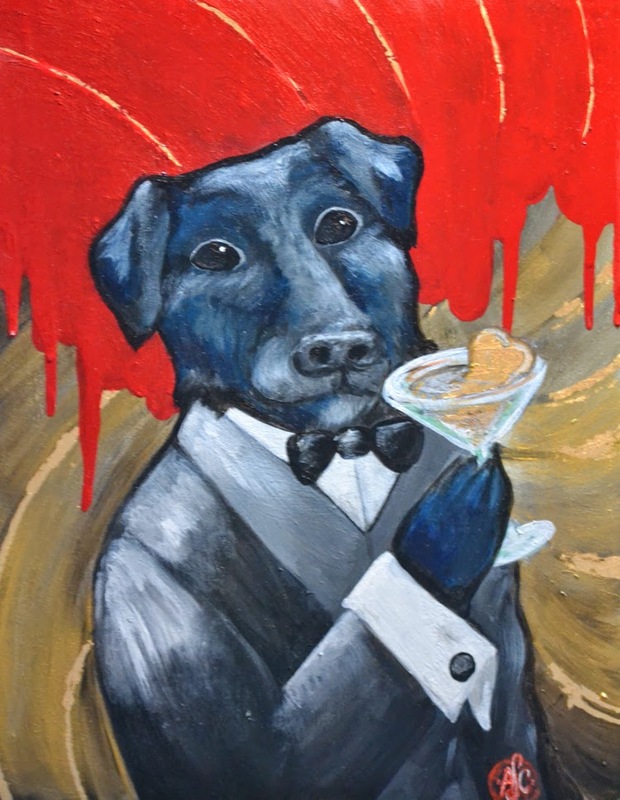 He is painted with some James Bond inspiration, and has a gold leaf bone floating in his "shaken not stirred" martini. I support the adoption of pets, I have even created works for Herpetology groups that find homes for rescue snakes, turtles, and lizards like bearded dragons (sometimes these outgrow one's expectations, oh no!) and my father-in-law has rescued guinea pigs. I hope you will attend the show! !